There's no accounting for taste when a masterpiece is ignored in a garage sale. It was the spring-clean that almost cost a Cairns woman a masterpiece. She had put a few household items in a garage sale, including a painting of a desert landscape priced just $6. It was signed Albert Namatjira, but she assumed it was one of the countless reproductions of his work that have been printed over the years. A potential buyer was put off because the signature was obscured, says the art consultant David Hulme, who was contacted by the woman - who asked not to be named - when the work didn't sell. ''I was delighted to see images of a fantastic example of an original Albert Namatjira watercolour,'' Hulme says. ''Collectors of his works are always interested in his beautiful interpretation of the gumtree and his mesmeric mountainscapes. ''This painting had the lot. It has not faded over time and it is large, too.'' Even more extraordinary, the 35-centimetre x 50-centimetre painting that the woman almost sold for $6 was conservatively valued by Hulme at $25,000. An approved valuer for the federal government's Cultural Gifts Program, Hulme admits it is difficult even for an expert to distinguish between an original Namatjira watercolour valued at up to $30,000 and a worthless print. Hulme also sought a second opinion from an auctioneer who agreed the painting was genuine, although admitting ''we always say subject to physical inspection''. Hulme evaluated its worth by comparing it with similar paintings auctioned in recent years. The painting needs some restoration work, Hulme says, which would need to be done in Melbourne or Sydney. He has asked the woman if she wants to sell the painting but she is yet to decide. According to Australian Art Sales Digest, Namatjira was the fourth-highest-selling Aboriginal artist at auction last year, with sales of $423,444. He was fifth-highest in 2010, with sales of $496,016. ''There have been just over 1000 sales of his work at auction but that figure includes many that have been sold more than once,'' says Wally Caruana, the former senior curator of Aboriginal and Torres Strait Islander art at the National Gallery of Australia. 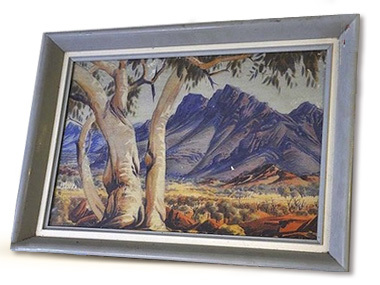 The highest price paid at auction for a Namatjira work was $96,000 for Hermannsburg Mission with Mount Hermannsburg in the Background in 2006. Namatjira was the first Aborigine to become a highly successful professional artist, according to Alison French, from the Centre for Cross-Cultural Research at the Australian National University and the author of Seeing the Centre: the Art of Albert Namatjira 1902-1959. French says that although Namatjira died in 1959, ''his legacy continues in the art of his descendants who paint watercolours that demonstrate ancestral connections to place''. Gloria Pannka is one of Namatjira's grandchildren who paint at the Ngurratjuta Iltja Ntjarra (Many Hands) Art Centre in Alice Springs. She says painting country is a way to ensure Namatjira's artistic tradition ''never dies out''.